Lopez and I work at Somerset House a few days a week and so our usual lazy commute through the fountains was interrupted on Friday by a little event you may have heard of: London Fashion Week. 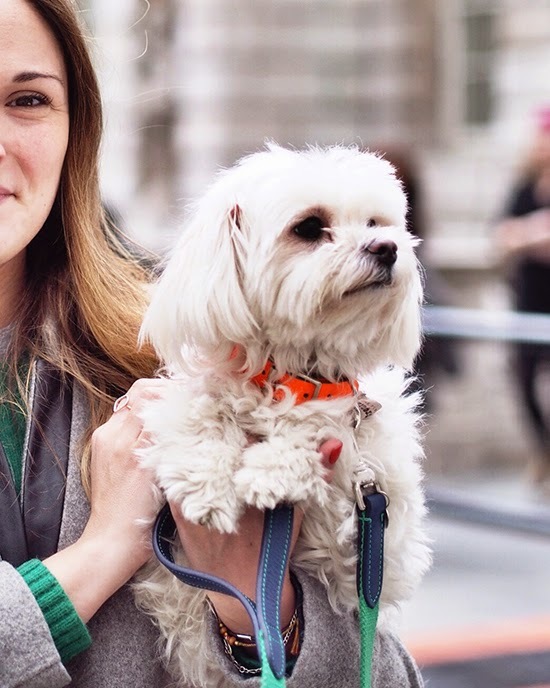 This was the dog's first experience and he found it all a little bit exciting (he had endless amusement barking at the photographers as they gathered around him, he clearly hadn't noticed that they were actually stampeding to take pictures of Susie Lau rather than him). Our visit was brief, we popped in to see our friends at Re Present with Anneli (seemed only natural to check out the cinnamon buns Scandi brands with Lopez's fave Scandi lass). 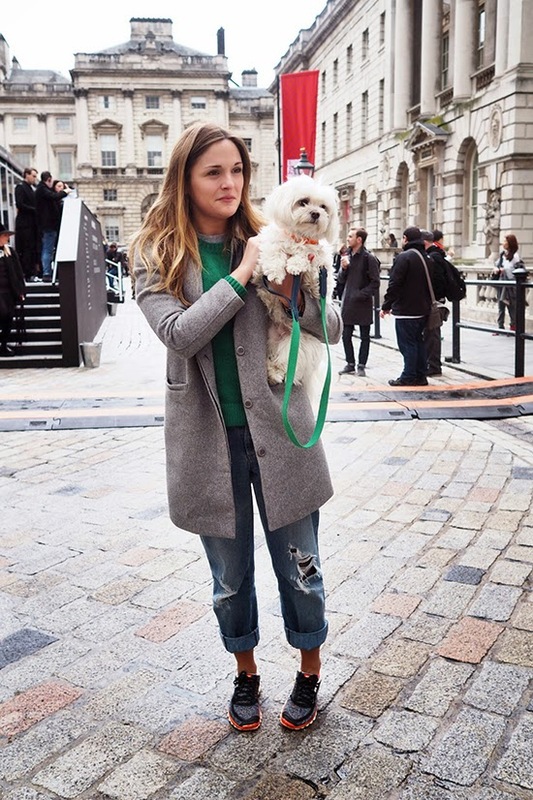 We then bumped into Julia and Topshop who took a quick snap of us for their its a dog's life feature on their blog. As you can see, I was less prepared than my pooch (!) but it was nice to get a photo together for once that wasn't a selfie in the mirror (although Julia is very good at capturing people doing selfies… here is the image she snapped of Alexa and Kendall that went a tad viral). This outfit is literally what I live in Mon-Fri at the moment. The grey coat was a purchase from Atterley Road last year from a brand called Twist and Tango, the jeans are my ultimate "must have" from ASOS (they're £19), the sweater is from Reiss (I have about 6 of them, the softest of soft even after umpteen washes) and the trainers are from the Liberty collab' back in 2013 (am now craving these newbies)… Lopez is wearing his present from the Mulberry team last year; his lead from the collaboration they did with Mungo and Maud, and his collar is from Creature Clothes at Pets Pyjamas.